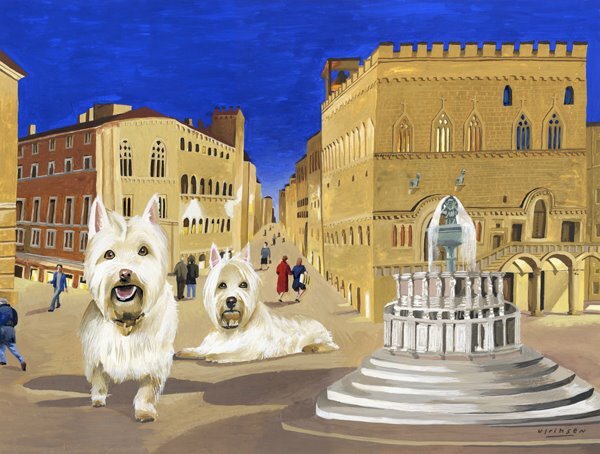 Two gorgeous (and rather large) Westies in Perugia, Italy, by the incredibly talented Mr. Mark Ulriksen. Don’t you just love the scale of these two guys, and that the people are just going about their business? I love it. You can read my previous post about Mr. Ulriksen here or visit his site here. As a graphic designer, you’re pretty much constantly bombarded with self-promotions from illustrators and photographers. And your desk is always buried with 3-inch thick directories of the same (that really only get used for either flattening something that’s being glued down for a presentation or, in the case of one firm where I worked that shall remain nameless, as trivets for hot and steamy pizza boxes on the conference table). So when you come across someone’s work that’s really great AND memorable, it definitely makes an impression and you keep all manner of pizza toppings far away from it. 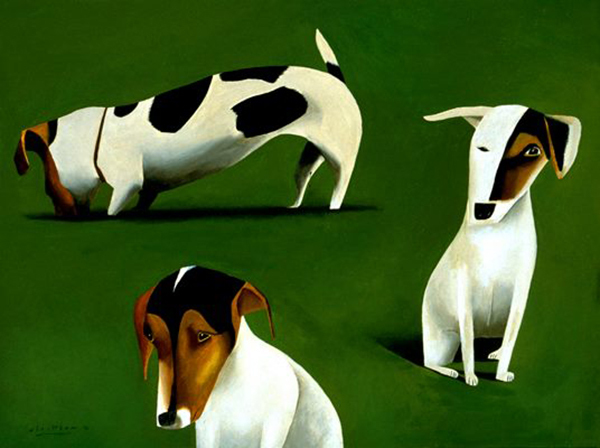 I remember the first time I saw something by San Francisco-based artist and illustrator Mark Ulriksen (and yes it’s because the subject matter was dogs, you got me there). I had picked up a copy of a newsletter titled The Berkeley Bark at the vet’s office, in Berkeley no less. At that time the newsletter was a black and white folded tabloid, with Mark’s work on the front cover. It wasn’t too many pages in length but it was good and so I would always eagerly await the next issue. It wasn’t long before The Berkeley Bark became the now-famous Bark Magazine and I’ve loved seeing Mark’s work there and other places, like The New Yorker where he’s a regular contributor, ever since. His work is also in the permanent collection of The Smithsonian and the Library of Congress. High fives. 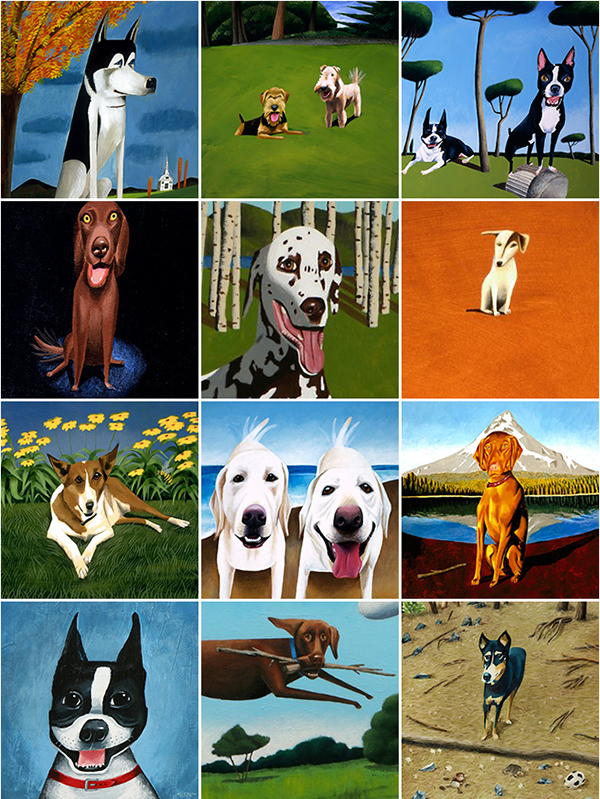 Now I should probably mention that not all of Mark Ulriksen’s work is about dogs, but I like them (and I’m pretty sure he does, too) so I’ve gone to town here. In addition to his illustration assignments he also does private commission portrait work, so one day I plan to send him an enormous shoebox full of photographs of all my dogs and a giant sack of coffee for the long haul. If you’d like to check out his site and more of his work, click here. If you’re interested, under “Show-and-Tell” click “Work in Progress” of the dalmatian painting featured above. Gosh, it almost makes you think you can do one yourself. But no.